HOUSTON (KTRK) -- A Houston cigar bar owned by State Rep. Borris Miles has been open and serving cocktails since 2010 without an occupancy permit and is out of compliance with key city codes, city emails and inspection records show. 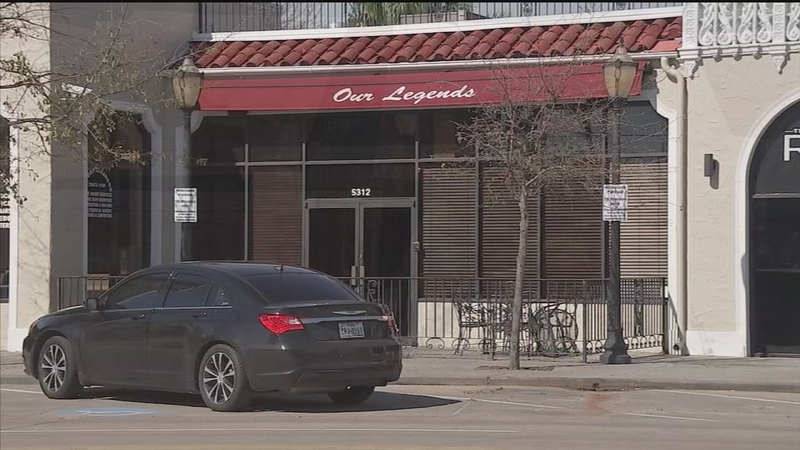 The bar, Our Legends on Almeda Road, owed the city $2,075 in unpaid fines as of February 10, according to city records. They also show the private club's second exit isn't up to code, exit signs are incorrect, and corrections are needed in both plumbing and restrooms. Over the last four years, it has repeatedly failed the city inspection process. That process is still ongoing. The bar has at least one powerful patron: Keith Wade, special assistant to Mayor Annise Parker and Miles' former campaign director. He denies using his influence to keep the bar open. Wade was at the bar during one October 2012 city inspection and introduced himself to the inspector as the "Mayor's rep," according to inspection records. Wade helped arrange a City Hall meeting soon after about the bar's certificate of occupancy issues. Ultimately, in February 2013, the bar's manager signed an agreement that required the bar to submit proper plans within two months or face tickets. Nearly two years later, bar management has yet to submit plans to the city that comply with city codes. The bar has been ticketed just twice in four years, and one of those tickets came after ABC-13 began asking questions in early February. Public works officials, who are in charge of building inspections and issuing occupancy issues, declined repeated requests seeking comment. Officials with the mayor's office, as well as Miles, told ABC-13 that Our Legends is not getting special treatment. Miles, a Democrat representing House District 146 in southwest Houston, which includes the bar, blamed the delay in getting the bar up to code on the city's regulatory process, calling it "almost a nightmare." "My staff has worked diligently with the permitting department," Miles said. "They're working on it. The process is in the process." Picayune? Or a patron with pull? ABC-13 has made dozens of calls to try to get someone from the city to explain why a Houston bar is still not in compliance with city codes years after it opened. Miles said he has gotten no special treatment. "What kind of special treatment?" he said. "If I had special treatment, I'd have a permit by now." Wade declined to go on-camera but said in a brief phone interview that he has "no pull" with the city in keeping the bar open or inspectors who would issue tickets at bay. Wade defended his involvement in assisting the bar through the permitting process. "Why can't I be involved?" he said. "It's a bar I know and have a relationship with. I happen to know the owner. The operation is working to come into compliance. There is no story here." Parker spokeswoman Janice Evans described Wade as a "troubleshooter." "You do need to have a certificate of occupancy, but we tend to work with businesses to get them to the point where they can meet the requirements," Evans said. "Often that can take a great deal of time." The lack of permitting at Miles' bar raised questions at the highest levels of the public works department. Emails from April 2014 obtained by ABC-13 show the department's powerful chief of staff asking questions about the bar's 2013 compliance agreement. And a department senior inspector alerted his boss -- Mark Loethen, deputy director of planning & development services -- about the bar's non-compliance. "The cigar bar at 5312 Almeda did not complete the permitting process which was started last year nor do they have a valid certificate of occupancy," senior inspector Jodie Foster wrote to Loethen on April 7, 2014. "The investigation will be renewed and I will keep you posted on its status." As recently as this month, top city staff looped Wade into questions about the status of Our Legends, emails show. In addition, Parker, Wade and Evans met concerning the bar and ABC-13's questions about it on February 9, according to emails. Evans said that Miles' bar was treated like many other establishments. ABC-13's investigation raised questions suggesting that may not be true. "We're not in the business of putting people out of business," she said. "When you put somebody out of business you not only hurt the business owner, but you hurt the taxpayers of the city of Houston. The inspectors have handled this like they've handled many others." Evans provided six examples of establishments that she said the city helped shepherd with patience through the permitting process. But a review of Evan's list raises questions about how helpful City Hall was in aiding those establishments. The former Penthouse Club. Evans suggested key dates to examine this adult business were between January 2006 and April 2010. On June 13, 2007 the City of Houston sued the business in civil district court asking it to be shut down for a myriad of issues. It was closed a year later after numerous visits from vice officers and other city inspectors. Mayor Bill White held a news conference in front of the closed club to speak about the court victory. It reopened in 2013 and now has a new owner. A restaurant on Gray Street. The owner told ABC-13 this about the city's permitting process: "I've been in business a long time, and this was the worst thing I ever went through." His establishment was not closed down, but it was threatened to be shut many times, he said. He doesn't recall how many times he was ticketed but said it was more than once. A second restaurant on Gray Street. Inspectors told the owner the certificate of occupancy the building had when he purchased it from another restaurant owner was not valid, according to the current owner. He had to lease and develop parking at his own cost, develop the sidewalk at his cost and re-permit the patio, he told ABC-13. He estimates he was red-tagged 10 times and ticketed another 10 times. His last recollection was that he was fined at least $4,000 in those years and spent $100,000 to comply with the codes. A Washington Avenue bar. Court records show the owner was forced to build a firewall and hire marshals for "fire watch" protection as the wall was built. A restaurant on Main Street. This is a vacant retail space. There is no activity here. City records show only an old Dumpster permit for that location. A Kleckley Street banquet hall. The owner told ABC-13 the process was "not stable." He did not open the space until he got his certificate of occupancy. He spent more than $30,000 to comply with plans and permit rules, he said. He told ABC-13 he was down to his last dollars and could not afford to stay closed any longer, so to avoid lengthy inspection delays he paid rush inspection and review fees. Without the rush fees, his plan reviews took 30 days -- much longer than Miles' bar. Evans said this issue did not deserve attention from ABC-13, calling the story "picayune." "It's not like there are issues where the building is crumbling and we're allowing people to go inside in an unsafe building," she said, noting that the mayor's staff often help business owners. When I've been out to dinner, I'll have business owners come up to me and say, 'I've got a permitting issue can you help me?' That's our job in the mayor's office."